A huge hello and welcome to all of the paper flower newbies out there! Whether you’re looking to make your very first crepe paper flower or perfect the technique for your 50th flower, you’re in the right place. This article has everything you need to know about how to make crepe paper flowers. We’ll teach you the essentials you need to succeed in making beautiful and realistic blooms that last. After reading through our tips and tricks below, you can browse all our crepe paper flowers here. The origin of your crepe paper makes a huge difference! Chinese crepe paper is cheap and very accessible but often the colors can be a bit on the neon spectrum and it doesn’t seem to have a great capacity for stretch. US crepe paper is non-toxic and great for kid’s crafts but it does have less stretch than European crepe. Italian crepe paper is fantastic and usually comes in 160 and 180 gram varieties that stretch well. The only issue with this crepe paper is that the machine lines across the grain of the crepe can disrupt the smoothness we like to achieve in our petals. Lia Griffith crepe paper is German-made. We have both extra fine and heavy crepe paper varieties. Our extra fine crepe has 150% stretch and our heavy crepe has 250% stretch. All of our crepe paper is beautiful and free of machine lines that break up the grain. We currently offer a total of 57 colors of crepe on our shop which you can find here. The weight of crepe paper is measured in grains but don’t let the number on the package confuse you. Choose a paper for its feel and workability, not for the number on its package. Not all patterns work on crepe paper because of the grain. If you cut a petal against the grain, it might become limp and oddly shaped. Because of this it is important to notice the direction of the grain when choosing patterns to cut and style. The patterns you will find on our site are all designed to work especially well with our crepe paper so you should have no worries about using one of them for your next project. A great starter pattern and flower is our crepe paper daisy. As we mentioned above, it is super important to align your selected patter’s grain marks with the grain lines of your crepe paper. We like to print our patterns onto cardstock so that they are sturdy enough to support the soft crepe paper. It’s very easy to cut multiple layers of petals and leaves by stacking multiple layers of crepe paper and using your trusty scissors to cut them all at once. Make sure you use scissors that are sharp enough to give you clean, crisp cuts. We love using our new Lia Griffith Signature 8″ Non-Stick Scissors for cutting crepe. If you’re looking to achieve a “V” in the grain of your crepe paper to mirror the texture of a leaf or flower petal all you have to do is line your pattern up diagonally along the grain of the crepe. The Cricut Maker Machine works beautifully for cutting our crepe paper. The reason this machine is incredible at cutting crepe is because its blade doesn’t drag like those of other machines. A dragging blade will tear your crepe paper instead of giving you the sharp cuts you want. Stretching and curling crepe paper is what gives your flowers a realistic look and brings them to life. To curl our flowers we use our new Lia Griffith Signature Curling Tool and curl in the same direction of the grain. You can also use 18-guage wires, dowels or skewers to curl your paper. All you need to do is form it around the hard surface with your fingers. To color your crepe you can use Pan Pastels, markers, or paints. We usually add color to our crepe after we have already cut all of our leaves and petals but before we assemble the actual flower. If you are using Pan Pastels to color your crepe be sure to use a mattifying spray to set the color before curling the leaves or petals. Double-sided crepe paper is a great material to have because it is smooth, elegant, and has a body weight that holds its shape really well. We have our own double sided crepe paper line but if you can’t find the color you want, you can make your own. We teach you how to make your own double-sided crepe paper in our craft school video here. There are multiple techniques to add dimension and texture to the center of your flowers. For round centers you can use hard foam balls. Before we cover the spheres we attach the stem by poking a hole in the center of the ball with stem wire and bending it back to double the wire. Then we hot glue it back into the hole with a hot glue gun.To cover the balls, cut an oval of crepe paper 3xs wider than the ball. Wrap and glue the long ends under the ball’s head and onto the wire, then gently stretch the crepe to form around the ball. Gather the crepe at the base and twist the ends around the wire with your fingers into a spiral and hot glue it in place. If you opt for a fringed center be sure to fringe along the grain line of the crepe. Once you fringe a strip of crepe, you can roll it up and attach it with hot glue then flatten the fringe to create a beautiful flower center. In our studio we store our crepe paper flowers in boxes with foam blocks in them to poke the stems through. Be sure to store your paper away from direct light since it will fade over time. Lastly, ensure your crepe is stored in a dry place. 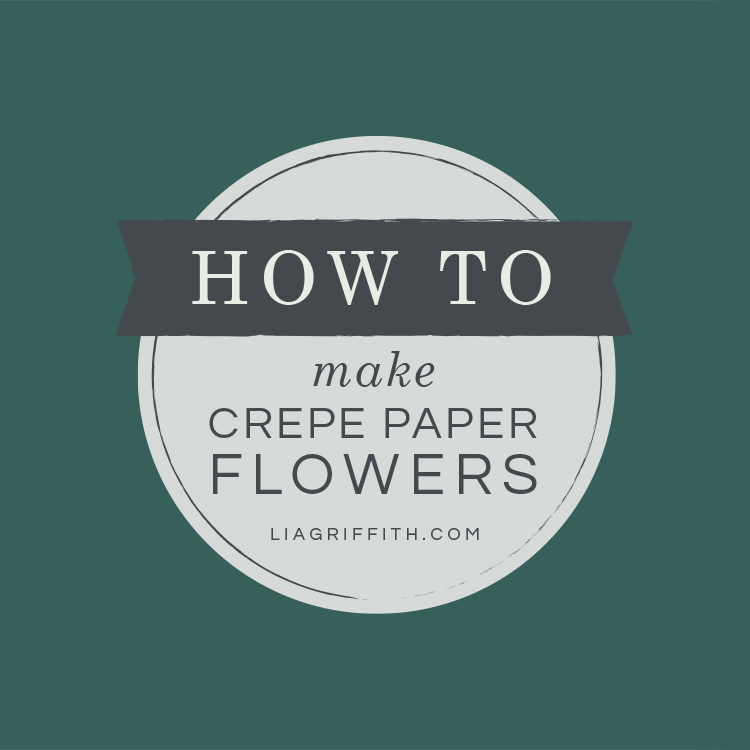 We hope that you’ve learned everything to need to know about how to make crepe paper flowers. We are here to help you explore your creativity with daily inspiration, downloadable cut files and printable templates that make your craft life easier. We believe in the power of creativity to nurture the soul and to empower us. Our designs are created with simplicity in mind and we always strive to provide you with the highest quality DIY’s. Share what you’ve been up to by using #MadeWithLia — your creativity is our biggest inspiration! Thks Lia for all your wonderful tutorials & videos.i love the details you add & the reasons for that information. You have passed on all this selflessly over many years. Can you cut crepe paper with a Cricut explore air? We haven’t found a way to successfully cut crepe on the Explore series, only the Maker. Thank you for the tips. I would like to cut crepe papers using my silhouette cameo. I wonder if you could tell me the details setting of your cricut machine such as speed, force, and type of material you choose from. The Cricut Maker has a rotary blade that works with crepe paper (and other thicker materials) because of the way it glides around the material and doesn’t drag & rip. I’m not sure the Silhouette has the same capabilities but you could reach out to their customer service and ask! Does anyone know where to find the German-made paper balls that Lia uses for the centers of many of her flowers? Unfortunately, we currently don’t supply the German paper balls. We hope to eventually stock them in our store! We do have some foam balls that are similar. But anything that makes the same approximate shape should work! Please let us know if you have any further questions and we happy to help! I would like to make red oriental poppy flowers for my mother 99th birthday and she loved one is it possible to get a how to make them? I also would like to make about 12 giant poppies to give to her wondering if you have a supply list and how to do? Her birthday party is May 20th so I will need to start working on the flowers soon. I appreciate any helpful tools and look forward to hearing from you. You have come to the right place! We have a video tutorial for Oriental poppies (https://liagriffith.com/crepe-paper-poppies-oriental/), and a pattern you can download with a membership (https://liagriffith.com/membership/). We don’t have jumbo poppies but if you search “Poppy” you might find a flower you can print at a larger size. I can’t seem to find the template for printable flowers, any flower? Hi Syliva, are you looking for something in particular? You can browse all our paper flowers here. Sorry Lia for my absence. Three weeks with the flu did me in. I had the vaccination but got the kind that doesn’t respond well to this flu. My doctor told me that the vaccination did help but that I wasn’t completely covered. I told him if this was a mild case, I didn’t want to see the bad. Enough complaining. I am alive and well and back on my flower making. Order everything I could in crepe paper, so I will begin to practice and will send pictures. Missed playing with you. Giggle! Hi Bev, welcome to our community! There is a link at the bottom of each post that you click to download. Check your Downloads folder or desktop for the PDFs! What a great article. I am what I consider a newbie and your wonderful site never fails to amaze me with the knowledge that you provide. I am a member if your site and love all that you do. I recently purchased the Maker and love the way it cuts everything, I recently finished an order for 2 dozen peonies and now have time to practice new flowers. Thank you so much!